Wołyń Voivodeship or Volhynian Voivodeship (Polish: Województwo Wołyńskie, Latin: Palatinatus Volhynensis) was an administrative region of interwar Poland (1918–1939) with an area of 35,754 km², 22 cities, and provincial capital in Łuck. The voivodeship was divided into 11 districts (powiaty). The area comprised part of the historical region of Volhynia. At the end of World War II, at the insistence of Joseph Stalin and the Soviet Union during the Tehran Conference of 1943, Poland's borders were redrawn by the Allies. The Polish population was forcibly resettled westward; and the Voivodeship territory was incorporated into the Ukrainian SSR of the Soviet Union. Since 1991 it has been divided between the Rivne and Volyn Oblasts of sovereign Ukraine. The Wołyń Voivodeship was created as one of the main administrative divisions of the newly reborn sovereign Poland after a century of foreign rule. The Second Polish Republic established its borders in the aftermath of World War I, as well as during the subsequent Polish–Soviet War resulting from Semyon Budyonny's military foray into former Russian Poland as far as Warsaw. He withdrew in panic during the 1920 major Polish counter-offensive. On 17 September 1939, following German invasion of western Poland in accordance with the secret protocol of Molotov–Ribbentrop Pact, Soviet forces invaded eastern Poland. As the bulk of Polish Army was concentrated in the west fighting Nazi Germany, the Red Army met with limited resistance and their troops quickly moved westward, invading the Voivodeship’s area with considerable ease. They met with the invading Germans along the Curzon Line and held a joint victory parade. Wołyń Voivodeship was overrun by the Wehrmacht in July 1941 during the German attack on the Soviet positions in eastern Poland. The draconian restrictions on Polish Jews were imposed in August 1941. The Łuck Ghetto was set up in the capital by the German occupation authorities, and sealed from the outside in December 1941 with the provision of only starvation food rations. The Ghetto population was about 20,000 people. During a four-day period in mid August 1942 about 17,000 Jews were rounded up by Orpo and the Ukrainian Auxiliary Police, and taken in lorries along with women and children to the Górka Połonka forest. They were shot in waves into the prepared trenches. In the years of 1942–1944 Volhynia was subject to genocide, conducted by paramilitary groups associated with the Organization of Ukrainian Nationalists (OUN), in particular, the Ukrainian Insurgent Army (UPA). These forces engaged in summary executions and massacres of the Polish population, along with the destruction of settlements. The razing of towns and villages would continue until August 1944. Władysław and Ewa Siemaszko estimate that around 60,000 Poles were massacred in the province. Ukrainians who opposed the attacks on Poles were themselves targeted with similar aggression. The Wołyń voivodeship was located at the south-eastern corner of Poland, bordering the Soviet Union to the east, the Lublin Voivodeship to the west, the Polesie Voivodeship to the north, and the Lwów and Tarnopol Voivodeships to the south. Initially, the Voivodeship’s area in the new Poland was 30,276 square kilometres. On 16 December 1930, Sarny County, comprising 5,478 km² of land, was transferred from Polesie Voivodeship to the Wołyń Voivodeship. As a result, the total area of the Wołyń Voivodeship increased to 35,754 km², making it Poland's second largest province. The landscape was flat and hilly for the most part. In the north, there was a flat strip of land called Volhynian Polesie, which extended some 200 kilometres from the Southern Bug river to the Polish-Soviet border. The landscape in the south was more hilly, especially in the extreme south-east corner around the historical town of Krzemieniec, in the Gologory mountains. The province's main rivers were the Styr, the Horyń, and the Słucz. The Wołyń Voivodeship was created formally on 19 February 1921. It was initially divided into the countries of Dubno, Horochow, Kowel, Krzemieniec, Luboml, Łuck, Ostróg, Równe and Włodzimierz Wołyński. On 1 January 1925 the gminas of Zdołbunów and Zdołbica of Równe country and gminas of Buderaż and Mizocz of Dubno one were passed to one of Ostróg. Center of Ostróg one was moved to Zdołbunów and was renamed as Zdołbunów one. Also gminas of Bereźne, Derażne, Kostopol, Ludwipol, Stepań and Stydyń were detached from country of Równe and one of Kostopol was formed. At same arrangements Majków gmina of Ostróg was passed to Równe one, Beresteczko gmina of Dubno one was passed to Horochow one, Ołyka gmina of Dubno one was passed to Łuck one, Radziwiłłów gmina of Krzemieniec was passed to Dubno one. 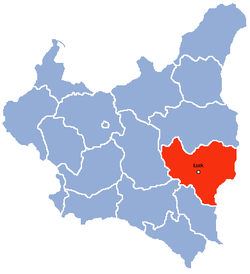 The capital, Łuck, had a population of around 35,600 (as of 1931). Other important centers of the Voivodeship were: Równe (in 1931 pop. 42,000), Kowel (pop. 29,100), Włodzimierz Wołyński (pop. 26,000), Krzemieniec (pop. 22,000), Dubno (pop. 15,300), Ostróg (pop. 13,400) and Zdołbunów (pop. 10,200). The capital of the Wołyń Voivodeship was Łuck, Volhynia (now: Lutsk, Ukraine). It consisted of 11 powiats (counties), 22 larger towns, 103 villages and literally thousands of smaller communities and khutors (Polish: futory, kolonie), with clusters of farms unable to offer any form of resistance against future military attacks. In 1921 the Wołyń Voivodeship was inhabited by 1,437,569 people and the population density was only 47.5 persons per km2. Around 68% of the population spoke Ukrainian as their first language, 17% - Polish; and 10% Jewish (mainly in towns). There were also German (2.3%) and Czech (1.5%) settlers, who arrived in the 19th century. In 1931, the population grew to 2,085,600 and the density – to 58 persons per km2. The primary religions practised in the area were Eastern Orthodox Christian (69.8%), Roman Catholic (15.7%) as well as adherents of Judaism (10%), some Protestants (2.6%) and a few Tatars of the Islamic faith. With respect to the Orthodox Ukrainian population in eastern Poland, the Polish government initially issued a decree defending the rights of the Orthodox minorities. In practice, this often failed, as the Catholics, also eager to strengthen their position, had official representation in the Sejm and the courts. With time, some 190 Orthodox churches were destroyed (some of them already abandoned) and 150 more were forcibly transformed into Roman Catholic (not Greek Catholic) churches. Such actions were condemned by the head of the Ukrainian Greek Catholic Church, metropolitan Andrei Sheptytsky, who claimed that these acts would "destroy in the souls of our non-united Orthodox brothers the very thought of any possible reunion." The land reform designed to favour the Poles in mostly Ukrainian populated Volhynia, the agricultural territory where the land question was especially severe, created alienation from the Polish state of even the Orthodox Volhynian population who tended to be much less radical than the Greek Catholic Galicians. The Wołyń Voivodeship was located in the so-called Poland “B”. The bulk of its population, especially the rural areas, was poor. Forest covered 23.7% of the province (as of 1937). Decades of Russian imperial rule had left Volhynia in a state of economic catalepsy, but the agricultural output following the rebirth of Poland quickly grew. Ironworks in Sławuta (est. 1840), run and owned by the LRL firm of Warsaw before Polish–Soviet War. The introduction of modern farming practices brought about a dozen-fold increase in wheat production between 1922/23 and 1936/37. 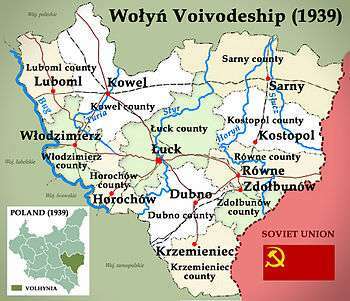 By 1937, the voivodeship was home to 760 factories, employing 16,555 workers. Mining, forestry, and food production provided employment for 14,206 individuals. Workers laid-off from industrial plants were also the most likely to start new businesses. In terms of ethnic composition among new business owners, 72,6% were Jewish, 24% Ukrainian, and 23% Polish. The province went through a recession in 1938/39. The tensions between Jewish and Ukrainian shopkeepers increased greatly after the introduction of cooperative stores, which undermined private enterprises, which were mostly Jewish run. Jewish owners were chased out of some 3,000 Ukrainian villages by 1929, with the emerging Ukrainian drive toward economic self-sustainability via cooperatives accompanying their new political aspirations. The situation was much better among the ethnic Czechs and Germans, whose farms were highly efficient. The railway network was thin, with only a few hubs, the most important at Kowel, with lesser ones at Zdołbunów, Równe and Włodzimierz. The total length of railways within the voivodeship was 1,211 km – just 3.4 km per 100 square kilometres. This was the result of decades of Russian exploitative economics. In 1938, Polish government began a program of electrification of Volhynia. By spring of 1939, a 30,000 volt power plant was built in Krzemieniec, which provided light and electricity for towns and villages five counties. Other power plants were not completed, due to the Invasion of Poland. The annual Volhynian Trade Fair (1929 - 1938), which took place in Rowne, was regarded as one of the most important regional fairs of Poland. In 1939, the fair was planned to take place on September 15–25. Prior to 1917 illiteracy was rife in Volhynia. The Russian Empire maintained only 14 secondary schools in the entire province. Under the restored Polish republic, the number of public schools greatly increased: by 1930, there were already 1,371 schools, growing in numbers to 1,934 by 1938. Illiteracy lingered and according to the 1931 census, as much as 47.8% of the Volhynian population were still illiterate, compared with the national average of 23.1% for the whole of Poland (by early 1939, illiteracy in Volhynia was further reduced to 45%). In order to fight illiteracy, Volhynian authorities organized a network of the so-called moving libraries, which in 1939 consisted of 300 vehicles and 25,000 volumes. The percentage of pupils in Ukrainian–language–only schools fell from 2.5% in 1929/1930 to 1.2% in 1934/35. Polish government of Ignacy Mościcki, in its 1935 April Constitution of Poland (Chapter 1), redefined the concept of state as home to all faiths and cultures (as opposed to a Polish "nation"), thus reducing the political impact, among others, of Ukrainian nationalism. Senators representing the German and Ukrainian minorities voted in Senat against the new changes, which were nevertheless passed on 16 January 1935. ↑ Janusz Cisek (2002). In Defense of the City of the Lion. Kosciuszko, We Are Here! : American Pilots of the Kosciuszko Squadron in Defense of Poland, 1919–1921. McFarland & Company. pp. 141–152. ISBN 0-7864-1240-2. Retrieved January 16, 2013. ↑ (Polish) Janusz Magnuski, Maksym Kolomijec, Czerwony Blitzkrieg. Wrzesien 1939: Sowieckie Wojska Pancerne w Polsce (The Red Blitzkrieg. September 1939: Soviet armored troops in Poland). Wydawnictwo Pelta, Warszawa 1994, ISBN 83-85314-03-2, Scan of page 72 of the book. 1 2 Dr Pawel Goldstein, Lutsk (Luck) Ghetto. Geni.com. "In the spring of 1942 a group of young Jews attempted to escape from the ghetto to the forests, but most of them were caught and murdered by the Ukrainians. A few, however, managed to join the Soviet partisans and fought the Germans as part of the Kowpak units." ↑ IZRUS (October 2011). "The forgotten December". The fall of "masada" of Western Ukraine. The Berdichev Revival. Testimony of one of the few surviving participants in the revolt, Shmuel Shilo from Kibbutz Tseelim, is preserved in the Book of Memory of Lutsky Jews "Sefer Lutsk" (translated from Hebrew). Retrieved 21 July 2015. ↑ Yad Vashem, testimony of Shmuel Shulman (Shmulik Shilo), Liquidation of the Jewish inmates of the Łuck labor camp in December 1942 on YouTube. Retrieved July 21, 2015. ↑ Andrzej Mielcarek, Wieś i kolonia Hnidawa, inaczej Gnidawa, powiat Łuck; Gromada Połonka. Interactive 1936 map included. Strony o Wołyniu Wolyn.ovh.org in Polish. Retrieved July 24, 2015. ↑ Yad Vashem, Mass-murder of Łuck Jews at Gurka Polonka in August 1942 on YouTube Note: village Połonka (Polish: Górka Połonka or its Połonka Little Hill subdivision) is misspelled in the documentary, with testimony of eyewitness Shmuel Shilo. Retrieved July 24, 2015. ↑ (Polish) Józef Turowski; Władysław Siemaszko, Zbrodnie nacjonalistów ukraińskich dokonane na ludności polskiej na Wołyniu, 1939–1945 (English: Crimes Perpetrated Against the Polish Population of Volhynia by the Ukrainian Nationalists, 1939–1945) Warsaw, Wydawnictwo von borowiecky Publishing, 2000. Second edition, foreword by Prof. Dr Ryszard Szawłowski. ISBN 83-87689-34-3. ↑ Internetowy System Aktów Prawnych (1921). "Ustawa z dnia 4 lutego 1921 r. o unormowaniu stanu prawno-politycznego na ziemiach, przyłączonych do obszaru Rzeczypospolitej". na podstawie umowy o preliminaryjnym pokoju i rozejmie podpisanej w Rydze dnia 12 października 1920 r. Dziennik Ustaw (Dz.U. 1921 nr 16 poz. 93). ↑ Ewa i Władysław Siemaszko, Wołyń w latach okupacji in Ludobójstwo dokonane przez nacjonalistów ukraińskich na ludności polskiej Wołynia 1939 - 1945, ibidem. ↑ Manus I. Midlarsky, The Impact of External Threat on States and Domestic Societie, (in) Dissolving Boundaries, Blackwell Publishers, 2003, ISBN 1-4051-2134-3, Google Print, p. 15. ↑ Subtelny, Orest (1988). Ukraine: A History. Toronto: University of Toronto Press. ISBN 0-8020-5808-6. ↑ "Słownik geograficzny Królestwa Polskiego i innych krajów słowiańskich". Volume X. Nakład Filipa Sulimierskiego i Władysława Walewskiego, Warsaw. 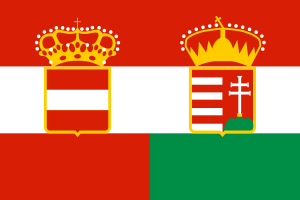 1880–1914. p. 793. Retrieved September 8, 2011. ↑ Konstytucja kwietniowa 1935 (April Constitution of Poland, 1935). Full text at Wikisource (Polish). See also: Czesław Znamierowski, "Konstytucja styczniowa i ordynacja wyborcza." In: Elita, ustrój, demokracja. Warsaw: Aletheia, 2001. ISBN 83-87045-85-3. Maly rocznik statystyczny 1939, Nakladem Glownego Urzedu Statystycznego, Warszawa 1939 (Concise Statistical Year-Book of Poland, Warsaw 1939).